Just picked up this C96 & am very happy with it, all matching even the sear is numbered. The red & white dots on the side is that to have a firearm brought into Australia the safety must be marked so it can clearly be seen !!!! so that is why the marks are on it as this happened when the pistol was brought into the country. Now what about the safety ??? 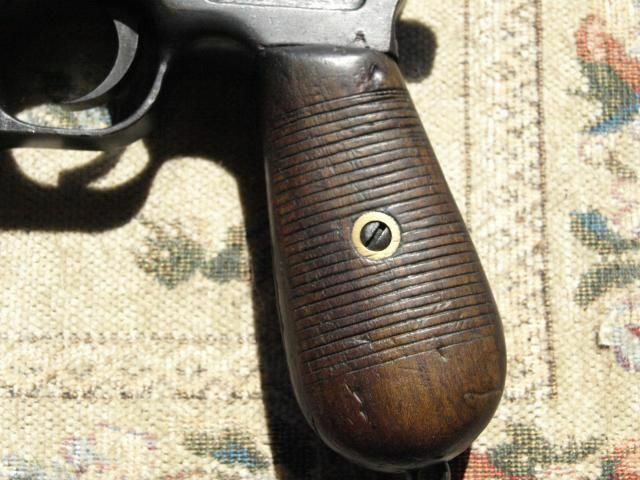 From my limited research I thought this was a pre war commercial 1905-1906 but the safety is marked NS & is numbered to the pistol so does that then make it a wartime commercial ? The safety lever has a hole right through it too ??? Any help with my new addition would be very much appreciated. 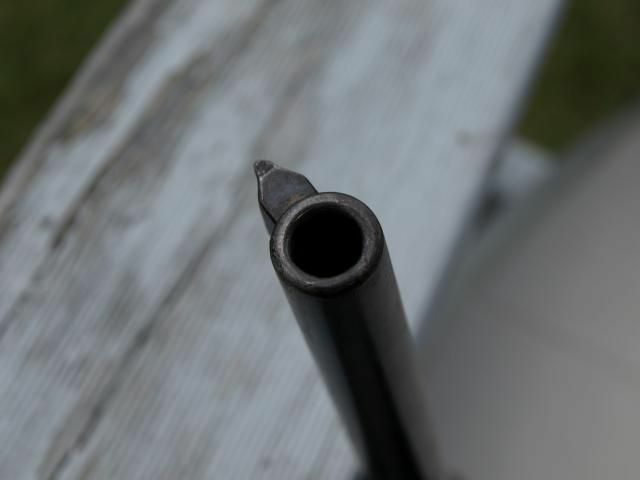 How many grooves in the rifling? 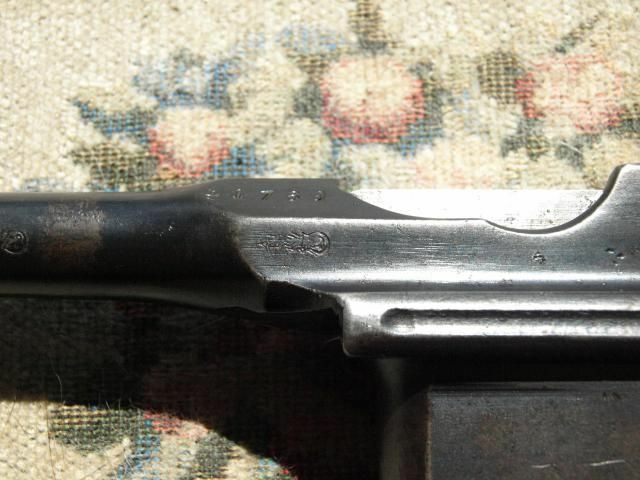 Earlier guns had 4; a couple of years before WW1 Mauser changed to 6 grooves. 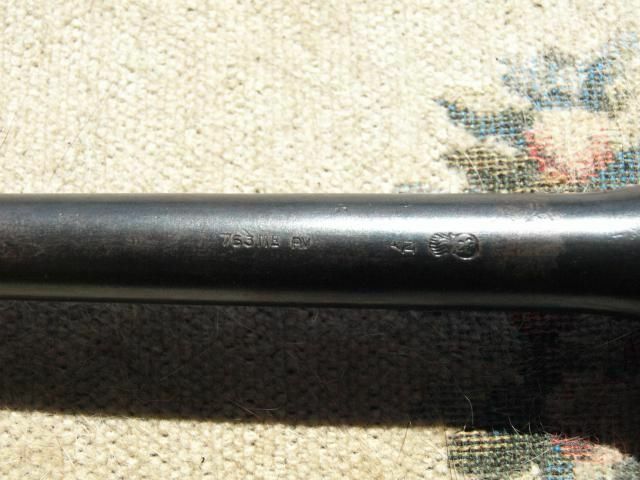 Thanks for helping me with some information as I am very confused about this pistol as on another forum I have been told it should be a Red 9 & that the barrel has been relined to 7.63 & is Belgum proof marked ???? That flaming bomb stamp does indeed look like a Belgian proof. That just means that sometime in the past hundred years someone brought it into Belgium and apparently had to have it re-proofed in some manner recognized by the Belgian proof house. If so, the thing inside the circle should be a script capital "L" - I can't tell from the photos. The big mystery is basically the serial number. The New Safety appeared in 1915, at Commercial serial number 280,000. 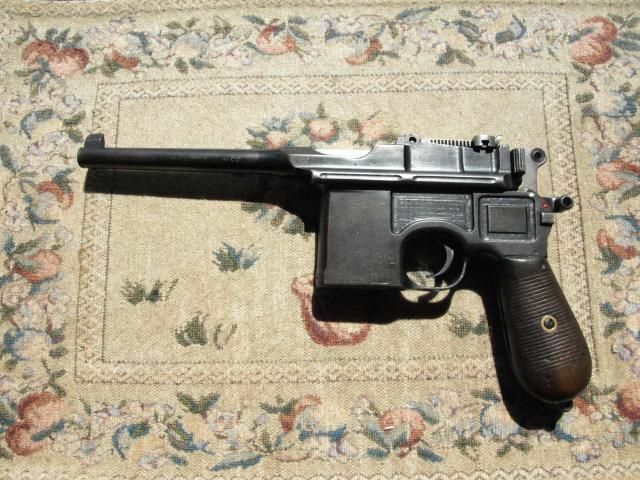 Some guns with slightly lower serial numbers have New Safety parts, properly numbered to their guns; these are almost certainly guns modified by Mauser with the updated parts. The ONLY thing necessary to update an older Prewar Commercial to New Safety standard is to change the hammer; but the safety lever was routinely changed at the same time because the solid safety knob was a recognition feature for New Safety guns. That was fairly sensible, as the knob was visible from the side of the gun, whereas the giveaway "NS" monogram was only visible from behind the gun. No other markings were added to modified/updated guns. New Safety guns having safety levers with through-holes are not unusual today. 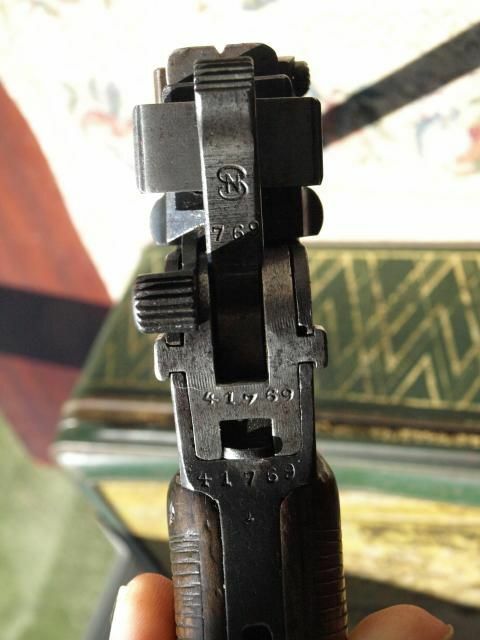 The usual explanation is that sometime since WW1 somebody put in a Prewar Commercial safety lever, either by accident (since, unlike hammers, the safety levers were not numbered to their guns) or deliberately because they thought it looked better. My own theory is that this updating of Prewar Commercials to NS standard was most commonly done with officer's guns which had been bought through the Army. When they came in for depot-level repair they were routinely shipped off to Mauser for modification. But this is just a guess. But it would account for the apparent fact that such modified guns have high serial numbers in the Prewar Commercial range, that is, somewhat higher than 200,000 - they were probably all guns sold between the outbreak of the war in August 1914 and the introduction of the New Safety a year or so later. So, why 41769 would have the New Safety is a bit of a mystery, if it was a Prewar Commercial gun. 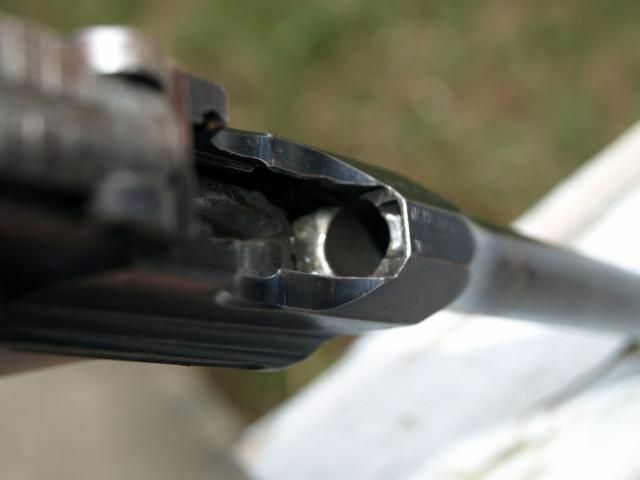 But the 6-groove rifling pretty much kills that possibility. 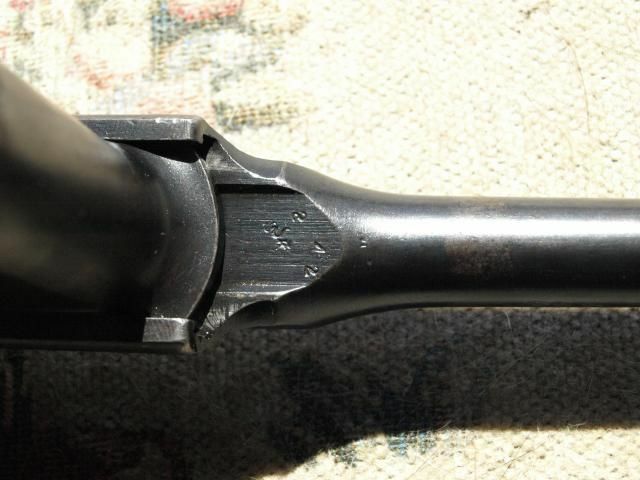 The change from 4 to 6 groove rifling happened at some uncertain point somewhere around 1910, at a serial number a bit over 100,000. So, we wouldn't expect to see any 6-groove Prewar Commercial gun with a serial number down in the 41,000 range. Now, looking at the frame milling on the side of the gun, I'm pretty confident that yours is a Wartime Commercial, or at least a gun made during the war. The wartime guns - the familiar Wartime Commercials and the Prussian Contracts - have somewhat rougher milling marks (the little circular patterns in the milled frame cutouts) than most Prewar Commercials. The Prewar Commercials weren't exactly polished in those areas, and the milling marks usually show, but they show more on the wartime guns. The frame cutout milling on the Prussian Contract guns can get downright sloppy. The Wartime Commercials are usually better than the Prussian Contract guns, but not up to Prewar standards. BUT ... the "900" on the sight leaf would be odd on a Wartime Commercial. 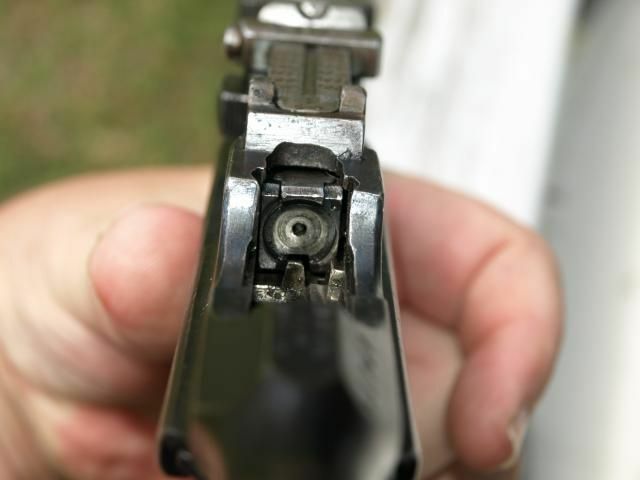 The old "900" mark disappeared on Prewar Commercials sometime in the 230,000 serial range, and the "1000" range mark moved from the left to the right side of the sight leaf. After the war some strange conversions were done, and some 9mm guns were sleeved down to 7.63mm. 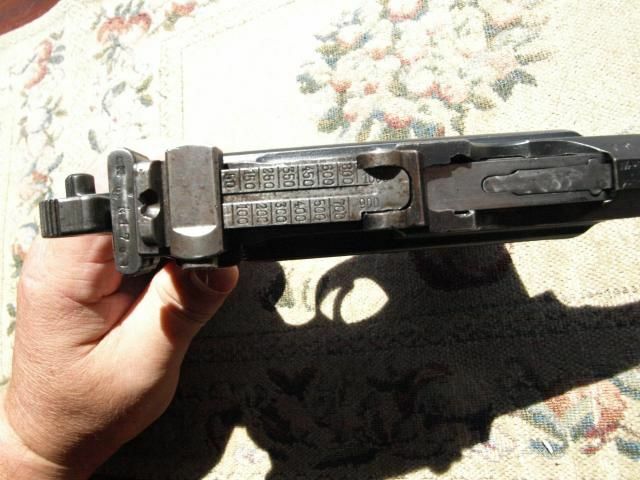 Usually there are no markings on the gun indicating such conversion. But that doesn't seem to have happened to your gun. 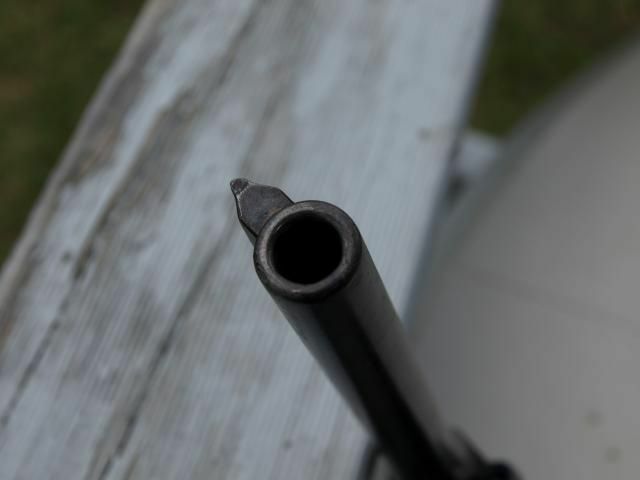 The 9mm guns had 500m sight leaves, and the ramp machined into the top of the slide was lower, flatter, and smoother, to account for the more curved trajectory of the slower 9mm bullet. From what I can see in the photos, yours has the correct ramp for a 1000m sight. 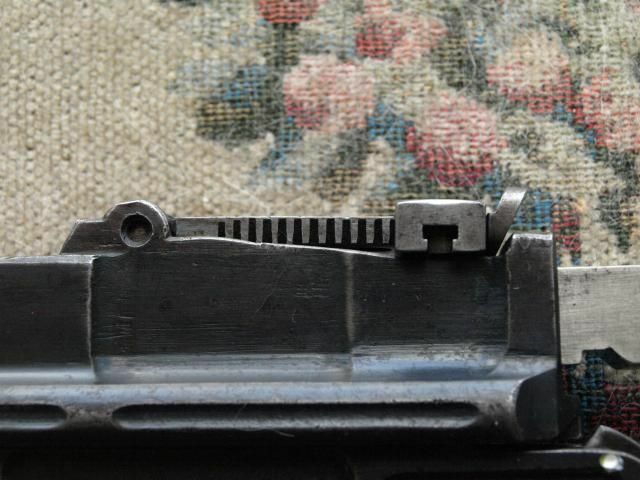 Postwar conversions from 9mm to 7.63mm didn't convert the gun to have a proper 1000m sight, with a properly-curved ramp; the sight leaf isn't hard to change, but modifying the low 900m ramp to duplicate the higher 1000m one would be a difficult (and expensive) job. 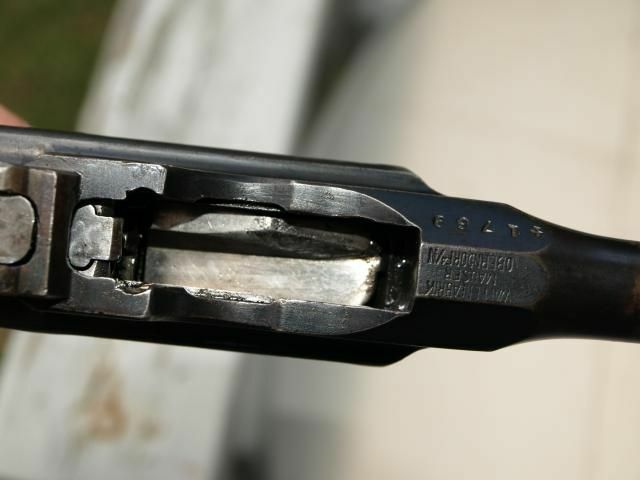 Another photo showing the side of your rear sight might answer that question better. There is another possibility, and that is that your gun was made during the war in 7.63mm, but as part of a different contract. The Prussian Contract (in 9mm) is the only contract we know about. BUT ... there is a theory about another poorly documented contract from that era. Erickson & Pate, in "The Broomhandle Pistol 1896-1936", call this the "Scandinavian" contract. 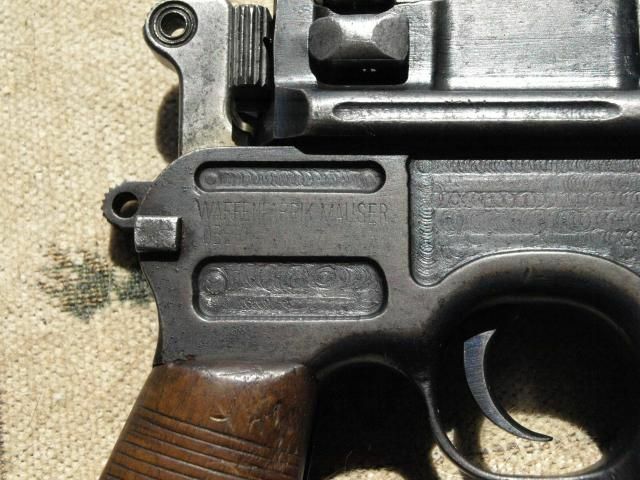 These are ordinary Wartime Commercial pistols in 7.63mm, with no unusual or distinguishing features except serial numbers in the 1 to 23,000 range. The justification for the name is slim; apparently a good number of these pistols have a Finnish Army "SA" property stamp. This doesn't really explain things very well, as your gun is well outside of that observed serial number range, and I'm fairly certain that the "Scandinavian" contract guns wouldn't have sights with a "900" range, but would be like the other Wartime Commercials without a "900". So ... some mysteries remain. Thanks very much for your help it is very much appreciated....Thanks. Here are some more pics for you. I forgot to say thank you so much for all your help I really appreciate you sharing your knowledge & expertise with me. The sight ramp looks normal for a 7.63mm gun with a 1000m sight leaf. There was no visible change to the sight ramp when Mauser fooled around with the 900 and 1000 meter markings. I'm about 100% certain that means that your gun was made in 7.63mm, and is not a conversion from 9mm. That leaves us with a mysterious serial number, rather than a mysterious caliber and rear sight ramp, and of those I'd rather have a mysterious serial number. Despite the serial number, I'm confident that it's a Wartime Commercial, and that means that it was made between late 1915 and late 1918. And of course the missing lanyard ring. Thanks very much wfw I really appreciate all you help. Thanks again & all the best. Off topic, but it's nice to see that some pistols can be purchased in Australia. nicky4968 wrote: Off topic, but it's nice to see that some pistols can be purchased in Australia.